While we can’t say much in terms of art, the season where we all go minimalistic in clothing is finally here. A season where we get to soak up as much of the bright warm sun as our bodies can allow, before we go back to our stylish fully-covering winter clothes. Necklines plunge deeper. Sleeves get shorter until they just completely disappear. Less becomes more. However, in the craze of minimalism, your wide-brimmed hat, oversized sunglasses and flip-flops need not be your only accessories. The Fashionista has to always be fashion-ready. Even with accessories. We’ve put together 6 pieces of jewelry every self-respecting fashion-lover has to have in her treasure box! Turquoise is the stone for spring. Bright, vivid and sprightly, it is tailor-made for the sun. Use it to your stylish advantage with turquoise stones set in a distressed metallic cuff. Odd as this combination may be the dull shade of the metal and the brilliant color of the turquoise forms a brilliant contrast along with a bit of a classic touch does a mighty fine job to set your spirits in tandem with the weather. 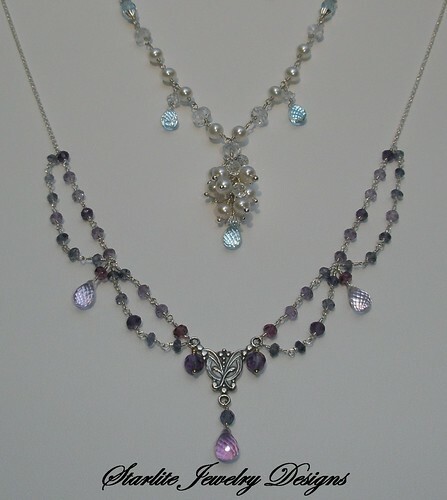 As the necklines deepen, the need for trendy summery necklaces greatens. Opals, yellow topaz, aquamarine and other light colored gemstones, form excellent choices for the same. You can opt for one string of any specific stone, or experiment a little and layer necklaces in different sizes and colors. For the night, you can stick to one single string of aquamarine necklace or a sterling silver chain with a statement pendant; whereas for the day, happy stacking and layering! Anyone who even has a remote idea about jewelry will vouch for the fact that you will never go wrong with sterling silver. This is your precious shot at using a combination that not many opt for- yellow stones set in sterling silver. Like we said, spring, in ways more than one, means that less is more. So, make sure this is the only ring you’re wearing. And trust us, a large citrine yellow rock bezel set into a smooth silver sterling ring is all you’re going to need to set you high on the fashion charts. Peach is one shade that manages to remain a hot favorite almost every spring season. Be it dresses or makeup, they never let you down. How about accessorizing this color? Think peach. Think peach cultured freshwater pearls. Pearls have this magical quality about them, that makes them so beautifully timeless and at the same time, placidly contemporary. Thus, doing a fine job as a day as well as a night accessory. A single stringed peach cultured pearl necklace with floral motifs and a delicate Morganite perched in the center forms a stunningly beautiful accessory, whether you wear it for a brunch with your girlfriends or a formal dinner party. Like turquoise, aquamarine too screams “Perfect spring jewelry”! The calm blue stone set in either of these metals, brings together a perfect balance of calmness and vibrancy. Therefore, managing to perfectly to stand out in the sun, while at the same time soothing the heated nerves of those who set eyes on it. Now just because spring colors are placed on a pedestal around this time of the year, doesn’t mean you can’t take the road less traveled. You’ll be surprised at how well stones like Onyx and Emerald go with this season. An Onyx necklace on a sprightly colored gown makes one bold head-turner. Speaking of bold, you can also try a huge rectangular emerald green ring, while keeping everything else to a bare minimum. Dark colored gemstones in statement pieces are quite a unique way to color-blocking and flaunting your quirky and uber-stylish taste in fashion jewelry. Today’s guest post is contributed by Josh Ferdinand. He is jewellery designer by profession and loves writing about new concepts in jewellery designing. He spends his free time cycling and hanging out with friends. Fit to be living...Or is that Living to be fit? I have a layered gemstone necklace that I barely wear – guess it’s time to break it out! I don’t think I have any citrine, but I have tons of turquoise jewelry! I love those two pieces you’re showing! Corina, I used to be a gold only girl, but have more and more silver. I switch back and forth, depending on what I’m wearing and/or my mood. 🙂 I don’t own a pearl necklace either, but if I see one at a good price, I’m going to get one. I am so out of fashion. I hardly ever wear jewelry. I love turquoise and it is perfect for spring! I’m boring & wear the same bracelet & necklace every day because my husband gave them to me, but I love my pearl necklace too & love that it’s “in”. Jewelry really dresses up a look! The jewelry is beautiful — I do not wear much on a regular basis, just my wedding band and maybe a pair of earrings but these I would wear for going out on a dinner date or a party.